Potosi senior outfielder Amber Udelhoven went 5-for-6 with three home runs, a pair of doubles and seven RBI in the Chieftains' 25–21 Six Rivers Conference victory over Pecatonica last Tuesday. POSTED April 11, 2019 11:19 a.m.
BLANCHARDVILLE — In non-conference action last Tuesday night, Potosi traveled to Pecatonica for a Six Rivers Conference game, where the two teams combined to score 46 runs and commit 23 errors. 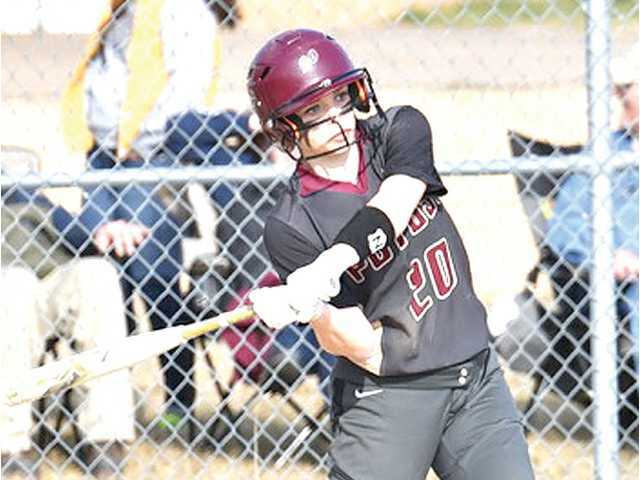 With an eight-run rally in the top of the sixth, followed by two more runs in the top of the seventh, Potosi (2–6, 1–1 SRC) overcame a 19–15 deficit after five innings to pull out a 25–21 victory. The hot bat belonged to Amber Udelhoven, who went 5-for-6 at the plate with five runs scored and six RBIs. Of her five hits, three were home runs, including two-run shots in both the fifth and sixth innings. She also hit a solo homer in the top of the seventh to extend the lead to 24–21. Avarie Breitsprecker finished 3-for-5 with two runs scored, while Jessica Noonan was 2-for-4 with two runs scored and five RBIs. Hannah Nusbaum had three RBIs on the night, while Kylie Reuter, Mykyalia Bauer and Shae Siegert each had two. Picking up the win in the pitching circle was Shae Siegert, who pitched the final two innings and allowed two earned runs while striking out one batter and walking six. In the first five innings Udelhoven allowed 19 runs, 16 earned, off seven hits, while striking out three batters and walking seven. Last Friday night, the Chieftains hosted their neighbors from Lancaster, winning 13–2 in five innings. Lancaster, which pounded out eight hits in the loss, gave up 13 walks and committed four errors, while Potosi won with just four hits, while committing three errors and issuing one walk. Senior Jadyn Noonan picked up the win in the pitching circle, allowing just two unearned runs off eight hits, while striking out 10 Lancaster batters and walking one. Noonan also led her team at the plate with two of their four hits, also scoring two runs and drawing one walk. The Chieftains scored eight runs in the bottom half of the first inning on four hits, six walks and one fielder’s choice. They followed up with one more run in the second and closed out the game with four more in the third, while holding Lancaster to just two runs in the top of the fifth. Last Saturday, Potosi was handed a pair of losses, a 10–0 shutout against host Cuba City, followed by a 6–2 loss to Dodgeville at the Cuba City Tournament. The Chieftains were limited to just two hits in their opener, while the Cubans blasted nine. In five innings of work, Noonan gave up 10 earned runs off nine hits, while striking out one batter and walking three. Against Dodgeville, the two teams were knotted at 2–2 after Potosi scored both runs in the bottom of the fourth, then gave up one run in the fifth and three more in the seventh. Potosi finished with four hits to Dodgeville’s eight, and committed three errors to their opponent’s one. Noonan surrendered one earned run on eight hits, while striking out eight batters and walking two. On Monday, Potosi was held to just one hit in a 3–0 Six Rivers West loss to visiting Highland. The Chieftains’ only hit of the night came in the fourth inning from Jadyn Noonan, who was stranded on third base after stealing second and advancing to third on a fielder’s choice. Highland pitcher Grace Pustina struck out 11 Potosi batters and walked just two in a complete seven-inning shutout. Noonan was in the circle for coach Reba Keene’s squad, giving up one earned run off seven hits, while striking out seven batters and walking two. Following this past Tuesday night’s road game at Benton, the Chieftains will travel to Juda on Thursday, then to Wauzeka on Friday and will host Darlington on Saturday. Leading hitters — Pot: Amber Udelhoven 5x6, Jessica Noonan 2x4, Avarie Breitsprecker 3x5; Busser 2x4, Loomis 2x4. 2B — Pot: Udelhoven; Pec: Busser. 3B — Pot: Udelhoven 3. W — Shea Siegert (1–3, 2IP, 0H, 2ER, 1K, 6BB). L — McSherry (7IP, 14H, 25R, 5K, 6BB). Leading hitters — L: Caitlyn Hahn 2x3; P: Jadyn Noonan 2x3. 2B — L: Lindsey Wolf, Hahn, Rhyann Luckey. W — Jaydn Noonan (1–0, 5IP, 8H, 2R, 0ER, 10K, 1BB). L — Brooklyn Connelly (2IP, 4H, 8ER, 1K, 5BB). Leading hitters — CC: Jenna Hill 3x4, Mati Terpstra 2x2, Josie Schmitt 3x3. 2B — CC: Hill, Schmitt, Terpstra. W — Kayla Stitch (4IP, 1H, 0R, 4K, 1BB). L — Jaydn Noonan (1–1, 5IP, 10H, 10R, 10ER, 1K, 4BB). Leading hitters — D: Walley 3x4, Kikenit 2x4. 2B — D: Walley, P: Shea Siegert. W — Lindsey Murphy (7IP, 4H, 2ER, 8K, 1BB). L — Jaydn Noonan (1–2, 7IP, 8H, 6R, 1ER, 8K, 2BB). Leading hitters — H: Haley Kleist 2x3. W — Grace Pustina (7IP, 1H, 0R, 11K, 2BB). L — Jaydn Noonan (1–3, 7IP, 7H, 3R, 1ER, 7K, 2BB).